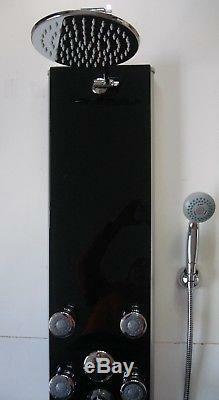 LUXURY THERMOSTATIC SHOWER PANEL WITH BLACK TEMPERED GLASS. Specification, features and whats Included. Shower Panel Tower or'Column' with Black Tempered Glass Front and a'brushed' Aluminium body. 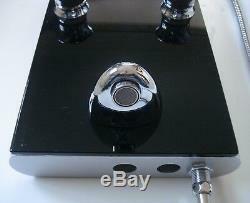 Solidly made metal/chrome control knobs. The upper knob is a Diverter Control for water flow and the lower one is a Thermostatic Temperature Control for comfort and safety. There is an override stop switch set at 38 Deg's C. 8 individually adjustable Hydro-massage Water Spray Nozzles Jets. 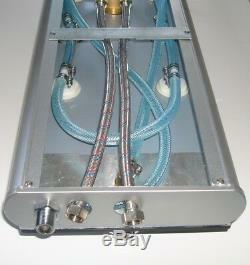 Each'Jet' pivots separately and the spray pattern can be adjusted. Each Jet has some 14 spray holes in total (8 in the centre and 6 surrounding them)! Large and solidly made (brass/chrome) 8 (20 cms) Overhead Shower Head with easy clean Rubber nozzles & Swivel joint on top. 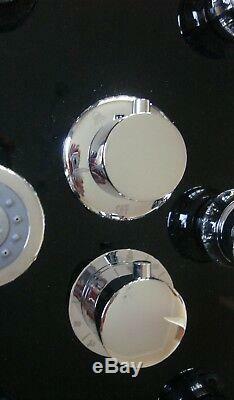 Adjustable Shower Arm (metal/chrome) - with 2'wing-nut' adjustment mechanisms. 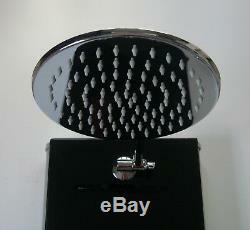 Handheld Shower Head, with adjustable spray patters and its own. A Stainless Steel flexi hose which is some 1.5m long. Bath Filler Spout or'Foot washer' as it is sometimes called! Corner Mounts are also available separately. The r ecommended operating water pressure is between 1 to 5 bar. 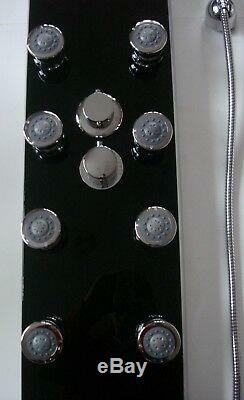 Overall width: 26cms (The Black Glass is some 24.5cms). Overall Height: 1.3 metres tall. Overall Depth of body: 7cms. 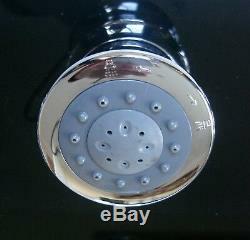 Main Shower head is some 20cms diameter. Length of Arm from Glass front: 24 (to centre of Head connection). Jets: 6cms wide and 5.5cms deep. It is simple to install. It comes with 2 brackets which are screwed into a solid/secure wall, and there are 2 metal'braces' across the back of the body which hang on these brackets. Then you connect up the 2 Flexible hoses situated in the lower half of the body to your Hot and Cold water feeds. These flexi hoses are approx 50 cms long and have 1/2" BSP compression nuts on their ends (inside diameter 3/4"). The Shower will work with C. Gravity fed systems (subject to adequate water pressures). Un-vented hot water systems or. Standard hot water cylinder type systems. The item "BLACK GLASS THERMOSTATIC SHOWER TOWER PANEL, 8 JETS, HANDHELD & BATH SPOUT 341N" is in sale since Sunday, July 8, 2018. 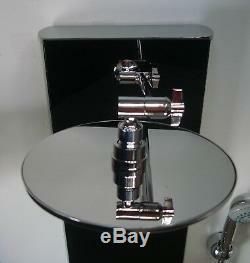 This item is in the category "Home, Furniture & DIY\Bath\Shower Plumbing\Complete Shower Units". The seller is "ourtapscom" and is located in Bournemouth. This item can be shipped worldwide.